This workshop is aimed at systems administrators that want a greater understanding of cluster technologies, as well as those end-users that want to better understand the systems that they work on for their day-to-day work. 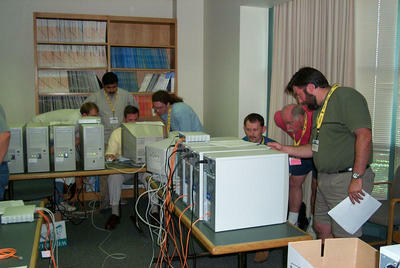 A basic understanding of system administration techniques is assumed; basic knowledge and understanding of Unix systems is recommended, but not required. Enrollment limited to 24 participants; application dates are listed below. (29.4M ) Introduce clustering basics - why they're useful, how they work, when you need them, basic programming techniques, different design options. 09:00 - 11:30 Hands-On Cluster Building - Clustermatic and ROCKS Groups of 3-4 people will put together four PCs into a working cluster. 14:30 - 17:00 Queuing Systems and Running Jobs Hands-On Users will run jobs on different cluster types, and get a chance to do some real work. Application deadline for the 9/22-23 workshop is 9/1. Participants will be notified of acceptance to the workshop on 9/15. For the 11/10-11 workshop, application deadline is 10/1, notification of acceptance occurs on 11/3. Please note that we cannot help participants with travel costs or arrangements, or any other costs associated with attending the workshop. Contact Us // Material on this page is copyrighted; contact Webmaster for more information. // Document last modified on 25 Feb 2013 // 2944 accesses since 21 Mar 2006 .